The Ateneo de Manila University Blue Eagles is scheduled for a Finals head-to-head game against the University of the Philippines Fighting Maroons at 3:30 P.M. on December 5, 2018 live from the Smart Araneta Coliseum. The “Battle of the Katipunan” will resume this afternoon and the Fighting Maroons are looking to extend the series to Game 3 while the Blue Eagles wanted to celebrate after today’s final buzzer has sounded. It was a scary moment for the fans of the University of the Philippines after seeing Bright Akhuetie fell on the floor and screaming for pain. That was after he got hit by Ateneo’s big-man Angelo Kouame in the third quarter of Game 1. 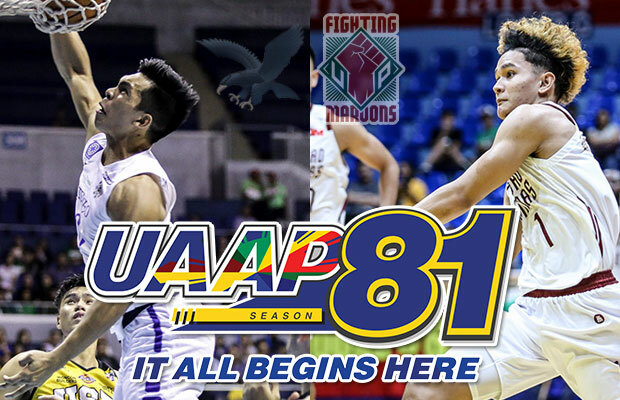 Here’s the good news for the Fighting Maroons, the UAAP Season 81 will be back in action and there’s no major injury found in his leg. That was confirmed by none other that UP head coach Bo Perasol. “Bright’s condition would be assessed on a day to day basis. MRI results show no major injuries though,” Perasol said in a text message to Rappler. UP’s team captain Paul Desiderio is expected to make a bounce back game especially in the scoring department after he was held to only five points. Ateneo on the other hand are definitely looking for the consistent game from their reliable guards like Thirdy Ravena and Matt Nieto. Ravena ignited the Blue Eagles in the first quarter to take the momentum to their side early in the game while Nieto finished it off in the fourth quarter as he registered his career-high in UAAP by dropping 27 points. Coach Tab Baldwin may still continue to utilize Angelo Koume as the main defender of Bright Akhuetie. Koume was successful on limiting his counterpart to only 10 points and 5 rebounds.